The second stage in information flow to control the model. This is where sources are mapped to channels for output. There are up to 32 possible mixes and 64 possible mixer lines can be configured. Each mix may have one or more lines; More on this below. At this stage a mix receives one or more sources (explained below), and maps them to channels in the outputs (screen). The inputs and sources are processed by multiplying their value by a weighting %, adding an offset and applying a curve. Values are in the range -100% to 100%. Each mix line maps to a corresponding output channel line on the outputs screen. More than one input or source may be combined on each mix line. A mix line without a mix centres the corresponding output channel line. Lines Used/Capacity: The number of mix lines configured out of a possible total. Line Monitor: The output from the selected line. Channel: The channel the line is mapped to. Multiplexer: Add the results from all previous active lines in the same mix with this line. Multiply the results from all previous active lines in the same mix with this line. Replace the results from all previous active lines in the same mix with this line. Weight: The weight % applied to the source. Switch: No switch configured. Processing always active. Switch configured. Processing active when switch condition is true (SB up/away). Slow/Delay: Both Fade and Delay configured. Fade in and or out processing configured. Delay activation and or deactivation configured. Line Name: The name of that processing line. Each mix may have a selectable activation switch. When no switch is configured the mix line is always active subject to the flight mode active condition. When two or more mix lines for the same channel are active they are multiplexed. The results from all previous active mix lines added, multiplied or replaced with the current line. When two or more replace mix lines for the same mix are active the last/bottom one is the one whose value is used. When a channel has no mix line active the value changes to the centre value, zero, is held constant. The settings screen is displayed and a processing line gets created. The whole line gets selected. Scroll to copy the line. Press ENTER to place a copy of the line. The selected line now has a dotted border. Scroll to move the line. Press ENTER to place the moved line. The settings screen is displayed. Up to 32 possible mixes and 64 possible mixer lines can be configured. Each mix may have one or more lines. CH6 has two mix lines. On this screen 6 mixes and 7 mix lines are seen. If 32 mixes have 1 mix line the the total number of possible mixes stays at 32 and 32 out of 64 mix lines have been used. If 32 mixes have 2 mix lines the the total number of mixes stays at 32 and 64 out of 64 mix lines have been used. Now if one on the mixes needs a third mix line then another mix will need to have it’s mix line removed. 32 mixes can not have 3 mix lines each. This would be attempting 96 mix lines which exceeds the 64 mix line maximum. 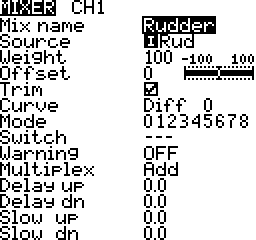 The name that displays at the end of the mix line on the mixer list. Sticks – Aileron, Elevator, Rudder and Throttle. Pots – Knobs and sliders. MAX – A fixed 100% value. Cyclic – CYC1 to CYC3 from the Heli Setup screen if present. Trims – Aileron, elevator, rudder and throttle stick trims. Switches – Transmitter switches SA to Sh if present. Example: Flight controller modes such as beginner, experienced, advanced. Channels – The outputs that get transmitted from one mix line can be fed back into another. Example: Ailerons on different channels need to be equal. Long pressing ENTER brings up a context menu to jump to a grouping in the list of sources. Move a source, Sticks, Pots, Trims, Switches, to select it. Percentage value of stick travel to use. Long Press ENTER changes from the static value to a global variable’s value. Example: Use MAX source for flaps and then weight to control the deployment amount. The value by which the source is added to or subtracted from. 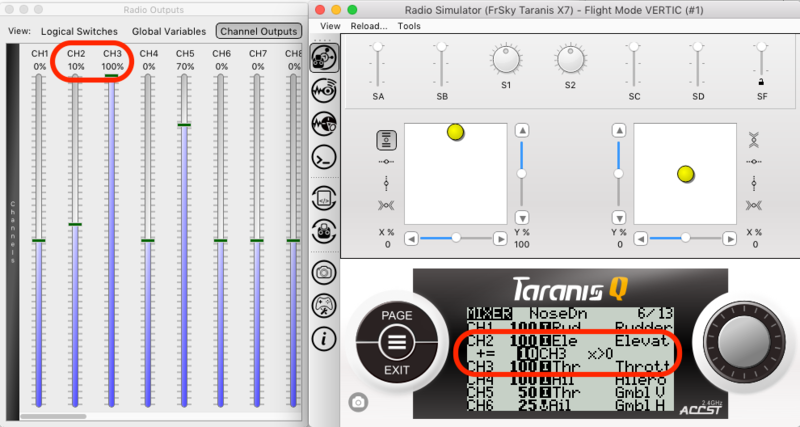 When viewing the mix output monitor the bar is moved left or right and the output value updates. Include the trim of the source if it exists. The source (plus offset) is changed by applying a mathematical function to it after the weight and offset have been applied. The graphs shown below are to illustrate the curve. The mix editing screen does not display the graphs. When the diff value is zero it is the the default linear curve. The output if equal to the input. If the diff value is not zero then the output is linear but the slope is different on either side of the centre, zero value. The output changes less near the input’s centre compared to the inputs travel ends. – – – When the function is not defined the output is equal to the input. x>0 The output is equal to the input when the input is greater than zero, else the output is zero. x<0 The output is equal to the input when the input is less than zero, else the output is zero. |X| The output is equal to the input in magnitude but is always positive. The flight modes the mix line is active in. When none are selected it is active is all flight modes. The modes and switch conditions are combined to determine the final active status. The switch that activates the input line. If none are defined then it is always active. The modes, switch and side conditions are combined to determine the final active status. Example: Each flap deployment has its own mix line selected by the same switch in different positions. Switch A up/away (SA↑) flaps up. Switch A centre (SA−) flaps partially deployed. Switch A down/towards (SA↓) flaps fully deployed. When the mix is active 1, 2, 3 beeps can be configured to be heard. The beeps continue to be repeated till the mix line is no longer active. Example: Have beeps when flaps are deployed. This may remind you after takeoff that you still have flaps deployed. Add the results from all previous active lines in the same mix with this line. Delay seconds in activating the line once the activation condition is true. Example: Landing gear wheels retracts one after the other. Use two mix lines, one for each landing gear with different delays. Delay seconds in deactivating the line once the activation condition is true. Example: Landing gear wheels deploy one after the other. Use two mix lines, one for each landing gear with different delays. Duration in seconds that the processing from the line is faded in. Duration in seconds that the processing from the line is faded out. The following example will help explain mixes. In this example an aircraft noses up when the throttle goes above its mid point. To compensate some down elevator is used. This can be put into a mix to automate the process. The elevator mix is where the mix will be added. When the throttle channel goes above its mid point. The throttle channel is added as a source to the elevator mix. Further a curve may be configured so that the throttle is only taken into account only when it is above 50%. The weight is determined by trial and error. Further a switch can be used to test the mix only when it safe to do so. Source CH3, throttle channel. Function X>0. Throttle 10% below its mid point. Elevator unaffected. Throttle 10% above mid point. Elevator changes by 1% because the weight is set to 10% an the curve X>0 activates the mix line. Throttle at 100%. Elevator changes by 10%. In this example an aircraft has a flight controller. On channel 10 a value of -100% (1000μs) puts it into level flight mode; A value of 0% (1500μs) put it into stabilize mode; A value of 100% (2000μs) turns it off. On channel 10 output one of three value -100% (1000μs), 0% (1500μs), 100% (2000μs). The channel 10 mix is where the mix will be added. When switch B changes position. Switch B is added as a source on the channel 10 mix. Switch B up/away. CH10 1000μs. Switch B centre. CH10 1500μs. Switch B down/towards. CH10 2000μs. Switch B up/away. CH10 -100%. Switch B centre. CH10 0%. Switch B down/towards. CH10 100%.